Boy…where DID September go? DANG…it feels like I just blinked and here it is the end of the month! I thought I’d share a card we did as a make and take at a workshop earlier this month. As you all know I just LOVE this little ghost…well, this entire set! 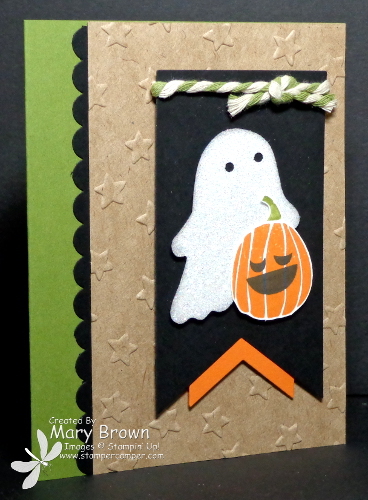 For this card, people had the choice to make either this card with the little ghost on it or they could make it as a fall card with just pumpkins it on it. Basic Black 3/4 x 5 1/2 – punch with Scallop Edge Punch, add behind the Kraft piece then add to card front. Cut out Basic Black using Banner Framelit and also a smaller Pumpkin Pie Banner with a smaller framelit. Layer the Pumpkin Pie banner behind the Basic Black one and tie a piece of the Natural/Old Olive Two Tone Twine around the banner and add to card front using dimensionals. From Ghost card – cut ghost from Dazzling Diamond Glimmer Paper using Ghost Framelit. Punch out eyes using 1/8″ hold punch and ad using dimensionals. Stamp Pumpkin using Pumpkin Pie, Old Olive and Basic Black, cut out and add using dimensionals. 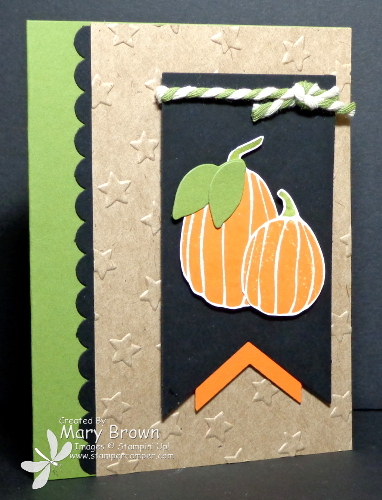 For Pumpkin Card – stamp pumpkins using Pumpkin Pie and Old Olive and add leaves in Old Olive. This entry was posted in Holiday Mini, Make and Take and tagged Fall Fest. Bookmark the permalink.